Russians still view Mikhail Khodorkovsky as a product of the 1990s and have limited sympathy for his plight. The second verdict against oil company YUKOS and its two former leaders, Mikhail Khodorkovsky and Platon Lebedev was postponed for 12 days, but Moscow Judge Viktor Danilkin finally began to read the 800-page verdict on Dec. 27, finishing about 4 p.m. on Dec. 30, two hours before the formal New Year reception in the Kremlin. The judge met the prosecution’s request almost in full, as both Khodorkovsky and Lebedev were sentenced to 13-and-a-half years in jail. The new term is to run concurrently with the eight-year sentence handed down in 2005, meaning that both men will not go free in 2011 (on the eve of the next presidential election), when their first term expires, and will remain behind bars until 2017, on the eve of another presidential election. The case against Khodorkovsky has become the most high-profile prosecution in post-Soviet Russia, but public opinion is split on it. Liberal-minded people condemn the case as politically motivated and see it as Prime Minister Vladimir Putin’s revenge for the challenge Khodorkovsky launched against the authorities in the early 2000s when he openly financed opposition parties in the Russian parliament. Others, while sympathizing with Khodorkovsky since he is behind bars – such sympathy for a man convicted of non-violent crimes being essentially Russian – at the same time believe that he deserves it. This is mostly because he was one of the country’s best known and richest oligarchs, who came to prominence in the 1990s by not very noble means, to put it mildly, and sometimes openly violated the legislation, imperfect as it was at the time. Khodorkovsky is a symbol of the barbaric privatization policies of the early 1990s, the results of which are still not accepted by much of Russian society. 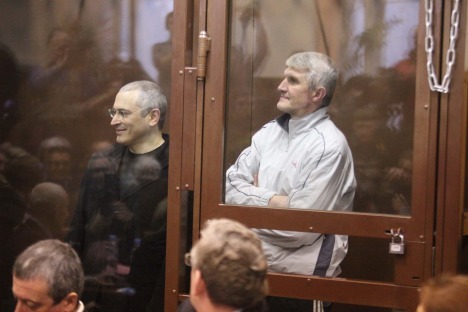 At their first trial, Khodorkovsky and Lebedev were convicted for large-scale tax evasion. The critics of the second case, which was initiated soon after the first verdict came into effect, insist that the case is, in itself, absurd, as Khodorkovsky is accused of “stealing” the bulk of the YUKOS oil by means of a complicated system of relations within his vertically integrated holding company, while also manipulating oil prices with YUKOS subsidiaries and on export markets. Also, in his effort to make YUKOS an international corporation (against the wishes of the Russian government), Khodorkovsky was negotiating to sell some of the YUKOS assets to leading international corporations, including Exxon and Chevron. In addition, there was the issue of price formation and special rules for reporting so-called oil well fluid, used cleverly, that provided huge opportunities for avoiding certain taxes. Yet such techniques were used widely by almost all Russian oil companies, as were many of the tax minimization schemes with which YUKOS was charged. Even so, appeals by critics that the same standards should also be applied to other companies, according to the principle of equality before the law, have not found a response among Russian judges. Tellingly, the same approach is often used by rank-and-file traffic police: When ill-fated drivers stopped for breaching traffic rules argue that everyone does the same thing, the traffic police normally tell such drivers to mind their own business, as it is they who have been caught red-handed. To give Khodorkovsky his due, he did not quietly accept his fate once behind bars. He kept giving regular interviews and publishing articles in the Russian media. In some articles, he even repented for what the Russian public sees as unfair privatization and called for a social and democratic future for the country. In other items, he slammed the authorities for their poor economic policy and corruption. With his critical statements, Khodorkovsky struck a chord with radical opposition members, who proclaimed him as their informal leader. This was a mistake, however, in the eyes of the general public, as most Russians, according to opinion polls, support the verdict against the former tycoon. This is where the Russian public disagrees with the West. Abroad, the second YUKOS verdict was met with widespread condemnation, including by heads of state such as U.S. President Barack Obama, German Chancellor Angela Merkel, and various NGOs. Internationally, the YUKOS case is largely seen as being politically motivated, which could mean serious diplomatic problems ahead for Russia. The U.S. administration has also threatened further difficulties for Russia’s WTO entry, a particularly harsh blow after all the hurdles seemed to have been overcome and hopes had been raised that the more than decade-long negotiations might be completed. There is apparently no simple, constructive solution in sight to the standoff. The Russian leadership, even if it is biased against Khodorkovsky, cannot objectively see him as a purely political prisoner, as all his political ambitions before his arrest and ensuing criticisms against the ruling regime do not provide adequate grounds for clearing him of his charges under the Russian legislation currently regulating the difficult and often contradictory relations between the Russian authorities and private businesses. And the Russian people continue to see him as a product of the 1990s getting his just rewards. So Khodorkovsky must remain behind bars, even if this is difficult for Russia’s western friends to understand.